Defense Minister Ehud Barak says 'sophisticated' Syrian weapons could find their way to Lebanon and Hizbullah if Assad falls. Defense Minister Ehud Barak warned Thursday that sophisticated weapons could be transferred from Syria to Lebanon and to the Hizbullah terror organization, should Bashar al-Assad fall. 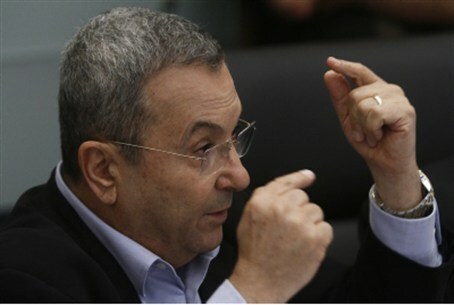 “You have to be alert to the possibility, so that during the fall of the regime there will not be the transfer of sophisticated Syrian weapons to Hizbullah and Lebanon,” Barak told Army radio. “We are tracking this issue constantly and carefully,” he said, without elaborating further. Barak said Israeli assessments suggest Assad’s downfall is only a matter of time, “The fate of the regime of Bashar al-Assad is sealed; his situation is getting worse every week." Israel has been closely following developments in neighboring Syria, where Assad has perpetrated a bloody, nearly year-long crackdown on anti-regime protesters. Israeli officials have expressed concern that Assad's fall would have regional consequences that could affect Israel. Officials have expressed concern that Israel's north could be inundated with Syrian refugees, or that Assad might attack the Jewish state to shift attention from his regime. Officials have also warned that Syria’s weapons, including alleged chemical and biological ones, could fall into the hands of terrorists, including Hizbullah, which fought a war with Israel in 2006. Last month, incoming IAF chief Major General Amir Eshel, said Syria possessed “huge stockpiles” of such weapons. “The immediate concern is the huge stockpiles of chemical, biological, strategic capabilities that are still going into Syria, mainly from eastern Europe,” he said. The UN estimates at least 5,400 people have been killed in Syria since the uprising began in March. But that figure is from January, when the UN stopped counting because deteriorating security prevented verification of the figures. At least 117 protesters have been killed by Assad forces in the past six days alone as the Syrian military continues to shell the focal protest city of Homs.